The Research of Porosity seeks to take the pulse of the city and determine it‘s social equation, as well as i t’s potential for further connection and enhancement of the public realm. Architecture is already permeable to public space. Increasing the permeability of architecture will change architectural design and urban planning imperatives. 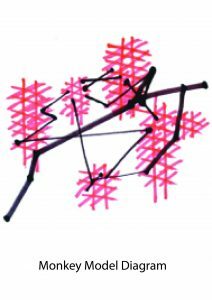 The desired effect of this serious of research is to expand the uses of public space within the city and alter the design of buildings, their adaptations and their l inking structures. If one can visit a toilet adjoining a corridor leading from the lift lobby at level X of building Y and stay within that space comfortably for 1 hour then that space constitutes a 1 hour public space. In other words, the city is full of spaces of transition, connection and bodily comfort, which have yet to be claimed or classified as types of public space within the city. Clues l ie within the networks of these spaces for what cities might become. I believe that by claiming these spaces as types of public space, and connecting their structures to the already sanctioned public spaces ranging from footpaths to parks, that only then will the city reveal to the architect/artist/planner its potential as a three-dimensional construction with the possibility of more than one ground plane. The total modelling of any western city is a much larger project than this 3-year research grant could afford. Therefore, it was necessary to summaries the Central Business District of Sydney via the selection of a series of zones or building samples which best represented the range of building types and program of this city. Not only was program considered but also a range of issues such as site permeability security sensitive types of buildings and access to public systems of transport. This would ensure that both government buildings and public buildings would be rep- resented. Finally, three zones were chosen for study, each including more than 4 tower structures within the block or blocks. 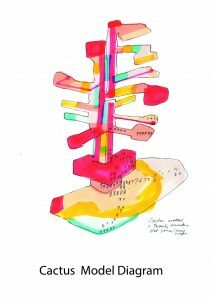 Tree models diagrammatize in 3 D of all the zones within a building that facilitate vertical and horizontal movement by visitors and inhabitants of the structure. Tree models look like an internal trunk and branch diagram of spaces within buildings, hence the name. It does not include private “destination” spaces such as actual offices or residences, rather, it distinguishes stairs, li f t cores, corridors, toilets, and carparks. The resulting diagram of connected volumes constitutes a model of possibility of access for visitors to the building. Tree models represent possible chiastic spaces according to available documentation. The final 3 D models were color coded to differentiate the varying types of ancillary spaces. All ultimately ‘not- public’ space was stripped away leaving the tree like skeleton. This modelling qualifies and classifies the potentiality of the “tree” model. Following field research, the reality of where the visitor might be able to infiltrate and for how long is tested and mapped through multiple rigorous diagrams and performance documentation. Sections of the original tree model may prove to be inaccessible and hence be excluded from the model. The tree becomes truncated and deformed. 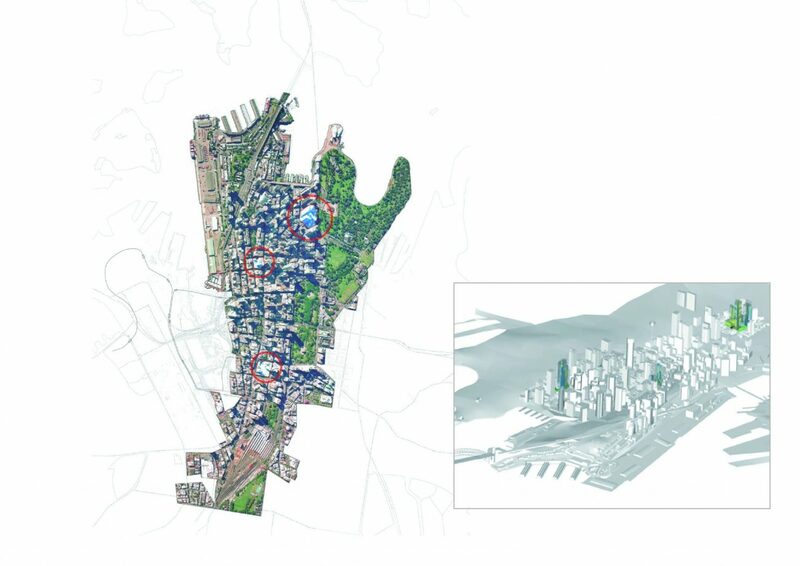 As the monkeys’ l ink arms, so we see how the city might make these connections and how public space can begin to be more three dimensional within the urban scale. As the project developed, the Maya modelling became more sophisticated and provocative. 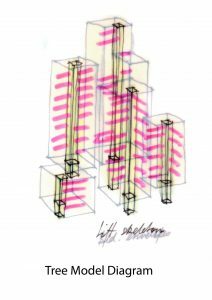 Diagrams of What a Building Desires, and indeed the data used in their manufacture, are also in a state of perpetual change. They are in fact momentary and respond to the data gathered at a particular time. This methodology could be a useful a provocation for analysis by Planners, Architects and Artists alike, who conceive of the city as a plastic material which loosely binds the social construction of the city.